Levi and Catcher and I spent the first weekend of the month in Tallahassee, Florida at the Tallahassee Dog Training Club’s annual obedience trial. Levi and Catcher and I spent the first weekend of June in Tallahassee, Florida at the Tallahassee Dog Training Club’s annual obedience trial. This was my first debut back in Utility since March of this year, a chance to see where my dog was in his training. There was a match on Friday but although that acclimates the dog to the environment that doesn’t necessarily mean all will be bliss in the competition ring over the weekend. Saturday we were ringside bright and early even though the Utility A class didn’t start until 10am. Both dogs were walked around the fairgrounds to blow off some extra steam, stretch muscles and empty them out. Levi was the last dog in the Utility A class of eight dogs. He was his usual animated self. We entered the ring and he immediately went “off-duty”, looking around and ready to bolt for the first Agility jump. But this wasn’t Agility. It was obedience. Inwardly I was mad already. I knew when the judge said, “Forward”, Levi would bolt out of position and our teamwork would be all downhill from there. Sure enough, our Utility heeling was atrocious. His usually brilliant, perfect signals were non-existent. We moved on to the scent articles. It was now an expensive match. He messed up the first article, leather, which he usually does perfectly. Nope. Not today. Then he settled down and aced the rest of the class, only losing minor points. This was repeated in all his classes over the weekend, including the Versatility class. That was a lot of money to blow: gas, entries, hotel and food. I was not happy on the ride home. Should I just lick my wounds and retire this dog or hang in there? I’m sure this is a question anyone who trains dogs asks themselves over and over again. But this time I found the answer to my training dilemma the next day, early Monday morning. Thanks to Joanne Permowicz of Leading Edge Obedience in Cantonment, Florida, who reminded me what she had shown me months ago, a method to remind Levi that I was in charge. Levi had taken control of the ring the minute his paws touched the matts. It was time I take full control of Levi’s every move, not just in the ring, but at home, in the training building and in the back yard. Within five minutes that Monday morning Joanne had Levi and I working as a seasoned team, Levi heeling perfectly by my side, his eyes fixed on me. If he gives me control of his life I will make sure he has food, toys, games and good health. No longer will I beg him to jump into his crate in the car or at the training building. No longer will I “ask” him to do something. No more “mommy” training; no more enabling him to disappoint me. But I had only two weeks to prepare for the next dog show. Could we get our relationship act together for the next show in Huntsville, Alabama? The drive to Huntsville in northern Alabama took me six hours. This time I stopped at every rest area, stretching my legs and pottying the dogs, which meant I arrived at the hotel more relaxed. The next step was to find the show site and set up my crates. It is always a good idea to locate show grounds before the day of the show. One never wants to be late, upset and unprepared. This site was a challenge to find, however, but with my iPhone’s Mapquest App and the club’s signs I finally arrived. The next morning Levi, Catcher and I were ringside bright and early. The first Utility A entrants seemed to take forever to go into the ring. It was finally Levi’s turn. I kept him close to my side, keeping his attention focused on me. We stepped into the ring. I barely acknowledged the judge because I didn’t want to give Levi an opportunity to look at the jumps with his usual anticipation. The judge said, “Forward”. Each exercise went smoothly. He did his heeling and signals, the best heeling he’s ever done in the competition ring. Next we set up for the scent articles, over which we spent so many months over the winter agonizing. Levi loves the turn and send. You can almost hear him saying, “Yahoo!” He found the correct articles that had my scent on them. As I heeled him over to the part of the ring where we would do the glove exercise Levi started to pick up on MY excitement. I whispered to the judge, “He’s ramping up!” She said, “I see that.” Could he hold it together for the glove exercise? He took my correct signal even though the turn and sit was not perfect. Next exercise was the moving stand, another exercise where Levi has had trouble. But he focused on me and only moved one foot. The only exercise left was the Directed Jumping, Levi’s all time favorite job. He must run straight back, sit when I tell him and wait until I signal and tell him which jump to take. He didn’t run dead center to the back of the ring but he did his job and when signaled, took the correct jump. We were only one jump away from his first Utility “leg”. As he took the last correct jump I started crying, which almost cost me the leg. Levi saw my face, came in to me and then moved back away from me. I must have smiled because he came back and sat in front of me. We had done it. Levi and I left the ring with me crying and giving him a pat on the head. Joanne Permowicz was there to congratulate us. We won first place too. Could we get leg number two the next day? We still had the Versatility class to go into later on that same day. The weekend ended with a Versatility title. Versatility is a mix of Novice, Open and Utility exercises. It’s now called an Optional Titling class, a fun class but one that has taken Levi and I about nine attempts to finish. If he did the two Utility exercises, he flunked the Novice exercises etc. He even finished the much harder Graduate Open title before Versatility. Graduate Open is a bridge between Open and Utility, a chance to ask yourself, am I really ready for Utility? Sunday morning I was a bundle of nerves. That isn’t a good sign for me. I needed to concentrate like I did the day before. This time we were in the ring quickly. All went well until I asked Levi to take the last two jumps. He gave me that look I know so well, as if to say, “I don’t want to jump today”. We flunked and missed our second leg. I had not demanded he take the jump. I had asked. It was my fault. But rather than be upset I wrote down what we need to do to train harder. Our next show was in Jackson, Mississippi, in one hundred degree weather. The show site was indoors and well air conditioned but going outside for longer than five minutes was very uncomfortable. Levi was entered in three Utility classes over the weekend. We came within a mere half a second of finishing his UD title. He was not doing his perfect signals any more, anticipating the recall each time. Everything else was really nice, although if we want great scores, as compared to good scores, we need to work harder. Why was he looking so stressed on signals? There were two training matches at the site so I could hopefully work through his problem but it just reappeared the next day. It became apparent the following Monday that Levi needs lots of distractions during signal work. We were able to replicate Levi’s stressed look in training, which is always a good thing. Once the problem is defined, the solution is easier to work through. Even better, I resolved to work Levi every day, diligently, for three weeks until the next trial. It’s been fun working through the problems and I feel positive Levi will be sporting a UD at the end of his name soon. 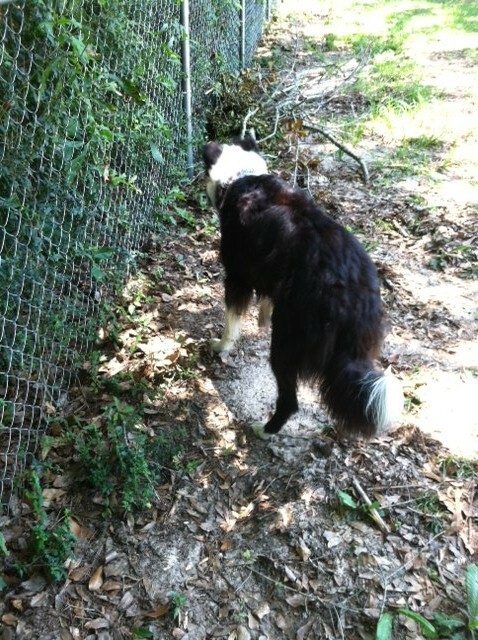 When we returned home after the Tallahassee trial I let the dogs run in the big back yard. We all walked along the fence line in the back of the property. I noticed Levi with his back leg hitched way up. He appeared to be favoring it. My heart sank. Had he pulled a muscle? Were our showing days over? There was nothing wrong with his toes, his toenails or his back. The next day at the same location I again saw Levi with his back leg hitched way up. Then I had to laugh to myself. This silly, sweet dog was tiptoeing. There is an Armadillo den along the fence line and he was stepping up quietly, in the leaves and sand, to catch sight of the animal. Most dogs point with their front legs. Most dogs will crouch and move one foot after another, slowly and consciously, toward their prey. Not Levi. As he gets close to the den he picks up his back leg so the Armadillo won’t hear him and then stands there on three legs, the left one hitched up high. I tried to take a picture but couldn’t catch the moment. Levi, you are one funny dog!! 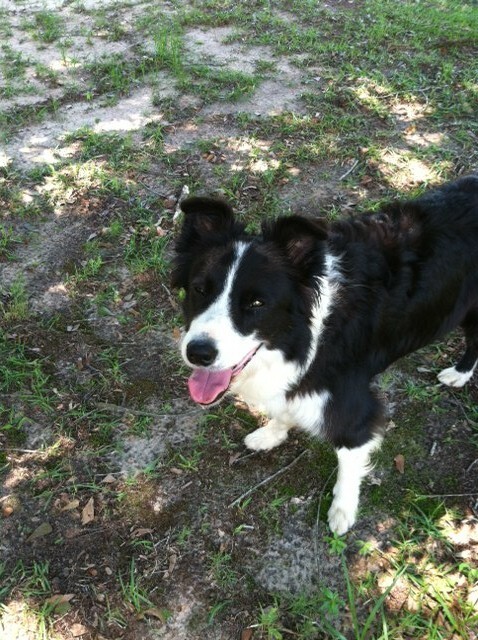 This entry was posted in border collies, Dog training, Retirement Life and tagged Border Collie, Border Collies, dog obedience, Obedience training, Obedience trial, Utility Training. Bookmark the permalink.